Virgin Atlantic may not be one of the mileage programs that you are the most familiar with, but they are definitely worth paying attention to for a few reasons. Flying Club miles do not expire for 36 months with account activity, including earning and redeeming miles, which is rather generous! It is possible to earn miles by flying Virgin Atlantic or its partners, using a Virgin Atlantic World Elite MasterCard from Bank of America, shopping through an online portal, and booking car rentals or hotel rooms with partnering programs. The number of miles passengers earn depends on flight distance, cabin choice, ticket type, and elite status. Flying Club has 3 elite tiers: Red, Silver and Gold. Red members earn the standard number of miles, Silver members receive a 30-percent boost in addition to standard miles, and Gold members receive a 60-percent boost in addition to the standard number of miles earned. For example, a Red member traveling round-trip in economy between London and Los Angeles will earn 10,908 redeemable miles. With a 30-percent boost, Silver members will earn 14,180 miles; Gold members will earn 17,452 miles with a 60-percent boost. Fly ANA First Class to Japan for 110,000-120,000 Miles Round-Trip! 8. Fly ANA First Class to Japan for 110,000-120,000 Miles Round-Trip! American Express Membership Rewards transfer at a 1:1 ratio to Virgin Atlantic Flying Club. You can earn Marriott points and transfer those to Virgin Atlantic at a transfer rate of 3:1. Plus, for every 60,000 Marriott points that you transfer, you’ll receive an extra 5,000 Flying Club miles bonus. In order to book any partner awards with Virgin Atlantic miles, you are going to have to get on the phone. It is best to confirm that space is available with another tool before you make the call. For example, you can check Delta availability at Delta.com, Singapore availability at Singapore.com, and South African availability on United.com. Once you have confirmed availability for the flights and dates you would like to travel, go ahead and give Virgin Atlantic a call. Remember that you cannot mix partners on award tickets. When you have enough Virgin miles for a trip, you can get some ideas by looking below and choosing one that appeals to you. Keep in mind there are tons of different ways to use your miles, don’t be limited to just the options we have highlighted! Use your Flying Club miles to fly in Virgin Atlantic’s Upper Class. Image courtesy of virgin-atlantic.com. Onto the first in our list of best ways to use Virgin Atlantic miles: flying Upper Class! Economy standard-season award flights between the United Kingdom and the United States vary between 20,000-30,000 Flying Club miles. The award chart is more or less distance-based, with East Coast cities requiring fewer miles than West Coast cities. Peak-season awards require 20,000 more miles based on a round-trip booking. 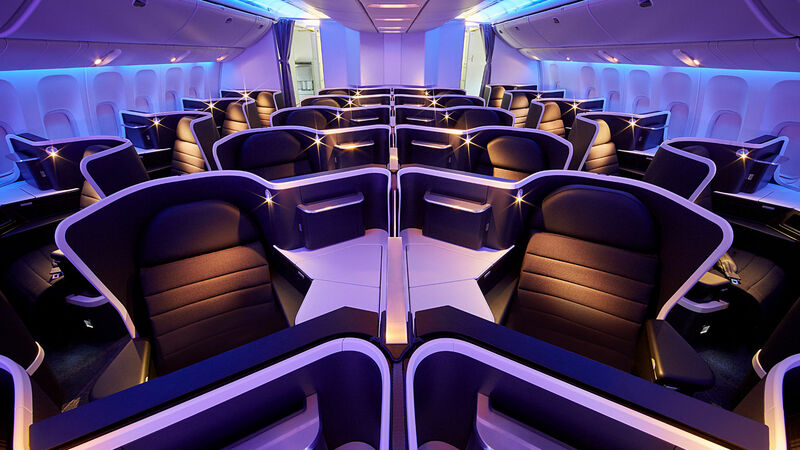 Premium economy tickets can be booked for 35,000-55,000 miles depending on the route, with Upper Class awards priced between 95,000-135,000 Virgin miles. Hot Tip: Need Help Booking? Check out our step-by-step guide to booking Virgin Atlantic Upper Class! Keep in mind that Virgin Atlantic imposes rather high fuel surcharges on its award flights, and you will also be subject to the high government and airport taxes when flying through the U.K.
For example, fees on round-trip flights between the U.K. and the U.S. range from $440 to $500. We’ve seen plenty of airfare sales that let travelers purchase a flight to Europe in economy for that amount, so an economy class redemption might not be the best use of Flying Club miles! Surcharges on premium economy awards range from $790 to $830, while fees in the Upper Class start at $1,100 and go up to $1,210. Peak dates in 2017 include March 31-April 18, June 22-September 6, and December 13-December 31. If you’ve already purchased a flight, it is possible to upgrade an eligible existing reservation booked with cash. 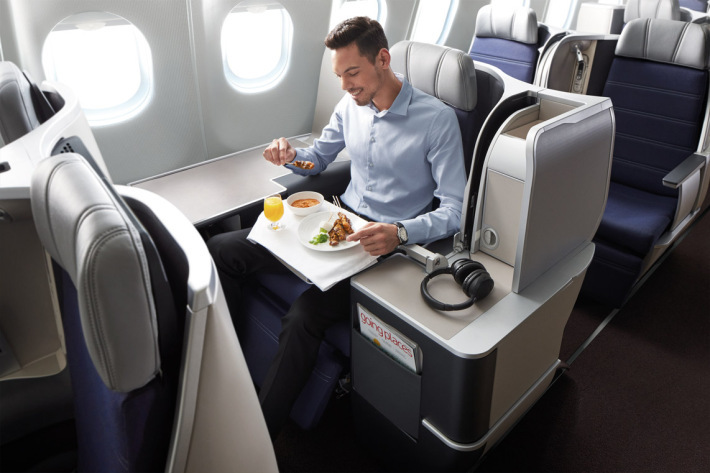 A flexible economy ticket can be upgraded to premium economy with miles at a 50% discount, or to an Upper Class seat at 25% off. Hot Tip: Use The Platinum Card® from American Express to get Global Entry and TSA PreCheck to make your trip go more smoothly. Fly to Hawaii on Delta with your Flying Club miles, and you’ll know exactly many miles it will cost ahead of time. Image courtesy of hawaii.com. Instead of providing a unique chart for awards booked on Delta metal, Flying Club simply applies Delta’s own mileage requirements for redemptions. Of course, Delta itself does not publish an award chart, but these redemption values are on par with Delta’s low-level awards. For example, a domestic round-trip award costs 25,000 Flying Club miles — an industry standard. Flights to Europe come to 60,000 miles, which is also similar to most U.S.-based carriers. Award flights to the Caribbean come to 35,000 miles, and awards to South America are 45,000. The sweet spot seems to be on award flights between the U.S. and Hawaii. Those require just 40,000 Flying Club miles, compared with 45,000 SkyMiles that Delta charges. Another notable exception here is that select routes to the U.S. originating in the U.K. come to just 40,000 miles in economy and 90,000 miles in business/first class. Those destinations include Atlanta, New York, Boston, Detroit, Minneapolis, Philadelphia, Seattle, and Salt Lake City. Origin cities include London Heathrow, Edinburgh (to JFK only), Glasgow (to JFK only starting in May 2017) and Manchester (to Atlanta only). However, remember the potential for high fuel surcharges as these flights originate overseas. When travel originates in the United States (for flights to Europe), it can save you a bundle in fuel surcharges! Singapore to Europe comes to 70,000 Flying Club miles in economy class, 120,000 in business class, and 180,000 in first. 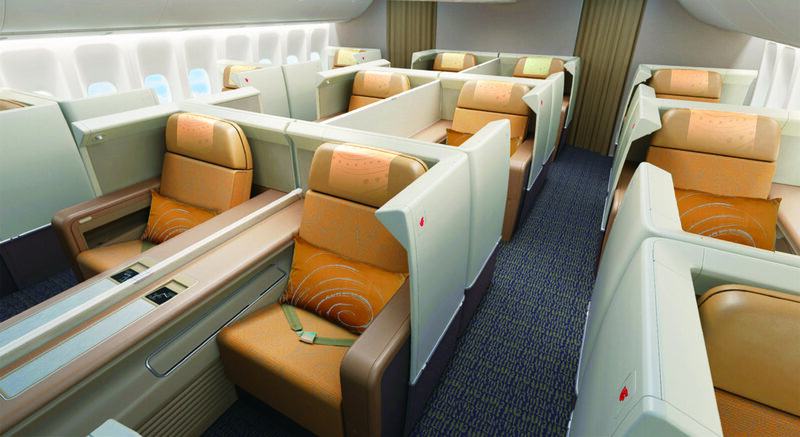 Singapore to Moscow specifically (via Dubai) comes to 70,000 miles in economy, 110,000 miles in business class and 165,000 miles in first class. Compared to 110,000 MileagePlus miles on similar economy-class routes when booked through United, these redemptions are not bad. Unfortunately, these awards could include high taxes as well. Intra-New Zealand redemptions come to just 15,000 Virgin miles in economy, but business class is not available. Awards between New Zealand and Australia (including the Pacific Islands) come to 20,000 Flying Club miles in economy and 30,000 miles in business class, which is pretty reasonable. As with other award flights, these can only be booked over the phone. Hot Tip: If you’re staying in a hotel, you might want to use a hotel credit card like the Marriott Bonvoy Boundless™ Card or Hilton Honors™ Surpass Card from American Express. You’ll get Gold elite status benefits and earn additional points for your stays! The award chart lists a round-trip flight from Los Angeles to the U.K. for 50,000 Flying Club miles in economy and 75,000 miles in business class, which are fantastic rates. However, it is difficult to find availability. 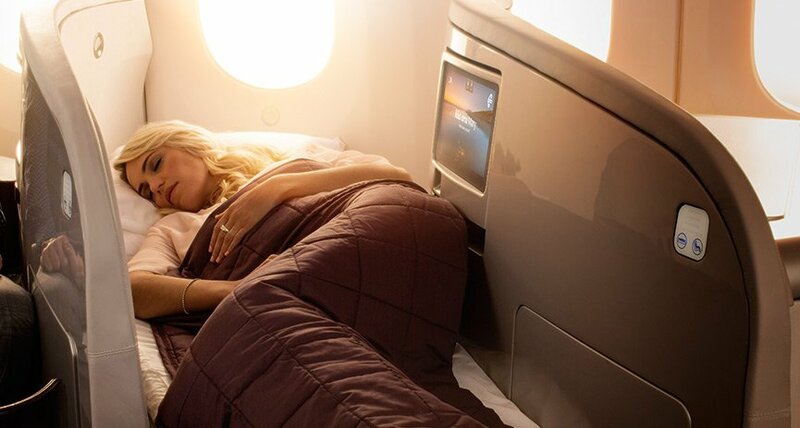 If you’re able to snag a seat on this route, consider yourself lucky as Air New Zealand doesn’t release many business-class seats to partners. You’ll find a similar situation applies to long-haul awards between New Zealand and the United States. In theory, a flight between Auckland and Los Angeles or San Francisco costs 80,000 Flying Club miles in economy and 125,000 miles in business class. In practice, however, those awards are virtually unavailable. For those still interested in trying out the airline, awards between New Zealand and Asia tend to be more available for booking through partners. Per the Flying Club chart, these round-trip flights can be booked for 60,000 miles in economy and 80,000 miles in business class. Fly around Australia in style with Virgin Australia’s business class! Image courtesy of virginaustralia.com. Redeeming Flying Club miles on domestic Virgin Australia routes can be a good option if cash flights are expensive. Redemption rates vary depending on the city pairs, from 15,000-40,000 Flying Club miles based on a round-trip booking. For example, Perth to Cocos Islands comes to 20,000 miles, and Sydney to Cairns costs 40,000 miles. Fuel surcharges do not apply to domestic tickets. Passengers can book one-way award flights for half the price of a round-trip award, meaning it’s possible to combine a few one-way awards for a tour of Australia. 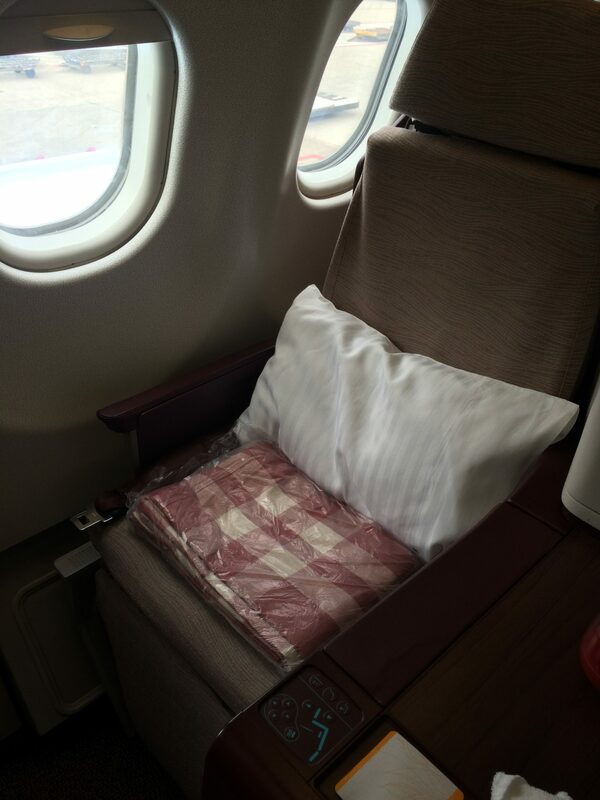 Hot Tip: Check out more fantastic cabin photos of Virgin Australia’s Biz Class in our review here! Beira, Mozambique; Blantyre, Malawi; Bulawayo, Zimbabwe; Gaborone, Botswana; Harare, Zimbabwe; Lilongwe, Malawi; Livingstone, Zambia; Lusaka, Zambia; Maputo, Mozambique; Maseru, Lesotho; Matsapha, Swaziland; Ndola, Zambia; Victoria Falls, Zimbabwe; Walvis Bay, Namibia; and Windhoek, Namibia. Round-trip economy tickets on these routes come to 20,000 miles, and business class tickets are 30,000 miles. Abidjan, Cote d’Ivoire; Dakar, Senegal; Dar es Salaam, Tanzania; Entebbe, Uganda; Kinshasa, Democratic Republic of the Congo; Lagos, Nigeria; Luanda, Angola; Mauritius; Nairobi, Kenya; Accra, Ghana; Pointe-Noire, Congo; Cotonou, Benin; Brazzaville, Congo; and Douala, Cameroon. Round-trip tickets on these routes would be 40,000 Virgin miles for economy, and business class tickets come to 50,000 miles. Open-jaws are allowed, but the point of origin and return must be the same. A maximum of 4 legs are allowed. Hot Tip: When you’re flying multiple legs and you need to check your bag, the chances of it getting lost increase. You can minimize that risk by getting baggage insurance from a card like the Chase Sapphire Preferred® Card or Premier Rewards Gold Card from American Express! If you want to continue elsewhere in Asia, unfortunately you are charged two separate awards so this deal really is only great for travel to Japan. Flying Club offers an interesting opportunity to redeem miles for ANA-operated flights. The award chart shows the same redemption level—15,000 miles—for all round-trip intra-Japan flights in economy class, no matter the distance. Whether a flight is 600 miles or 4,000 miles, it doesn’t matter: it will cost 15,000 Flying Club miles to book. Neither business class nor first class redemptions are available, and these redemptions can only be made by phone. You may not think of luxury when you think of Jet Airways, but you will get a fully flat seat in business class! Image courtesy of Caroline Lupini. Jet Airways is an India-based airline with headquarters based in Mumbai. Flying Club provides a distance-based award chart for Jet Airways flights, meaning the longer a flight is the more miles will be required to book. Round-trip flights that are 1,400 miles or shorter cost 20,600 Flying Club miles in economy and 37,000 in business class. Flights between 1,401-1,999 miles in distance can be purchased for 30,000 miles in economy and 54,000 miles in business class. First class cannot be booked on these flights. 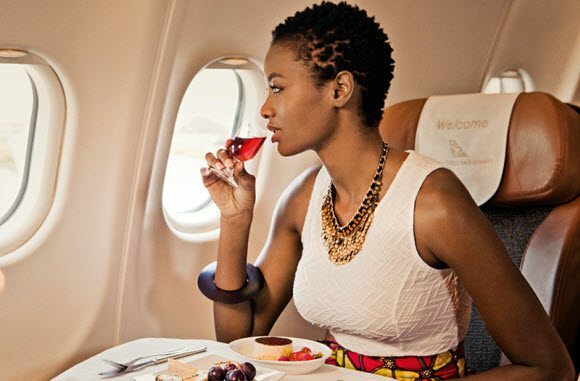 Longer flights, however, do allow first-class redemptions. Flights that are between 2,000-7,600 miles long can be booked for 41,000 miles in economy, 82,000 miles in business class, and 120,000 miles in first class. Flights between 7,601-14,000 miles will cost 54,000 Flying Club miles in economy, 108,000 miles in business class, and 162,000 miles in first. 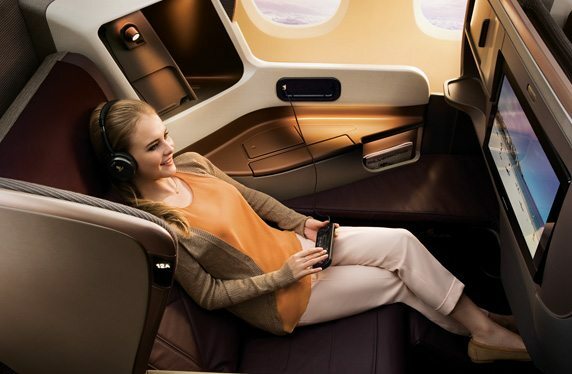 Finally, flights that are 14,001 miles or longer can be purchased for 95,000 miles in economy, 190,000 miles in business class and 282,000 miles in first class. One open-jaw is allowed, but stopovers are not permitted. All domestic and international flights can be booked with Virgin miles as long as there’s availability. At least 7 days advance notice is required to secure a reservation. Just in case you couldn’t find availability to Hawaii on Delta, you can also check Hawaiian! 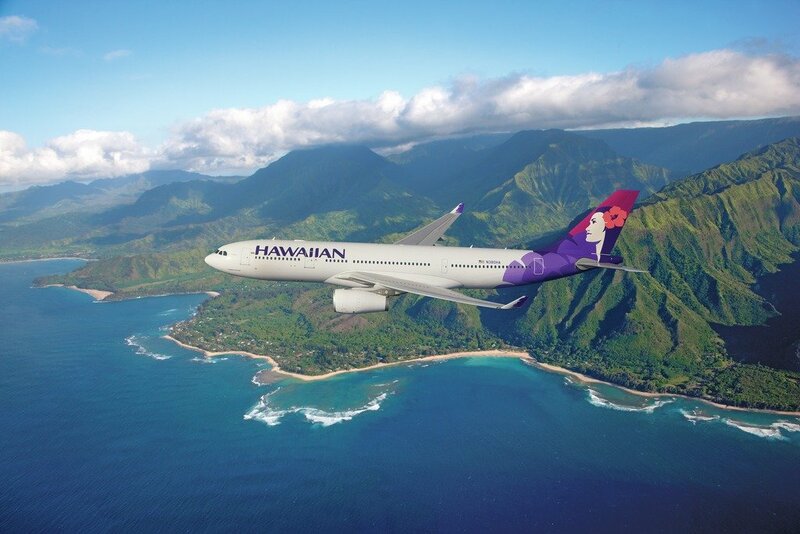 Image courtesy of hawaiianairlines.com. Flights from the West Coast to Hawaii and back require 40,000 Flying Club miles in economy and 80,000 miles in first class. East Coast cities cost a bit more at 80,000 Flying Club miles in economy and 130,000 miles in first class. This redemption clearly benefits those located on the West Coast! 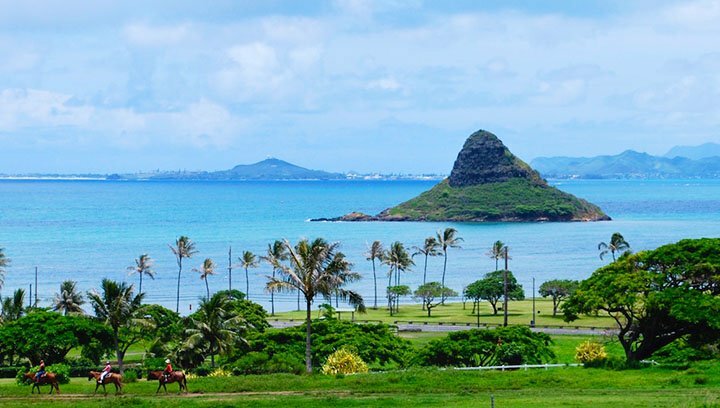 In comparison, it is possible to book cheaper awards to Hawaii using British Airways Avios or Air France/KLM Flying Blue miles for 25,000 and 30,000 miles, respectively, provided there’s availability on American Airlines or Delta Air Lines. When booked directly with Delta, United, or American, this ticket would cost 45,000 SkyMiles, 45,000 MileagePlus miles, or 45,000 AAdvantage miles at the saver level. At least Flying Club provides redemption rates that are competitive with U.S. airlines! The best part about these redemptions is that Hawaiian Airlines doesn’t charge exorbitant fuel surcharges on award tickets. For those already on the islands, it is possible to use Flying Club miles to island hop! An inter-island itinerary requires just 15,000 miles in economy or 30,000 in first class. Because one-ways and open-jaws are allowed to be booked with Hawaiian Airlines, the legs can be booked as separate segments, allowing travelers to visit multiple Hawaiian Islands on the same trip. Malaysia Airlines business class is a great way to fly. Image courtesy of thedesignair.net. Although many redemption options on Malaysian Airlines aren’t the most lucrative, there are a few that can be a good use of your Flying Club miles. For example, domestic round-trip awards from Kuala Lumpur to the West Malaysia region (Malay Peninsula) come to just 20,000 miles in economy class and 40,000 miles in business. Domestic awards from Kuala Lumpur to East Malaysia (Malaysian Borneo) come to 30,000 miles in economy and 50,000 in business class. First class redemptions are not available on these routes. Bangkok, Thailand; Phuket, Thailand; Medan, Indonesia; Jakarta, Indonesia; Surabaya, Indonesia; Yogyakarta, Indonesia; Denpasar, Indonesia; Ho Chi Minh, Vietnam; Phnom Penh, Cambodia; Hanoi, Vietnam; Yangon, Myanmar; Singapore; Manila, Philippines; Cebu, Philippines; and Hat Yai, Thailand. Round-trip economy tickets on these routes come to 35,000 miles, and business class tickets are 55,000 miles. Again, first class seats are not available on these routes. Flying Club members can earn miles by flying the following airlines: Delta Air Lines, Singapore Airlines, Air New Zealand, Hawaiian Airlines, Malaysia Airlines, and Scandinavian Airlines (SAS). Redeeming Virgin miles is allowed on all partners except SAS. Award seats can be booked up to 330 days in advance. Hot Tip: For more information on Virgin Atlantic’s loyalty program, check out the Virgin Atlantic Flying Club Loyalty Program page. While Virgin Atlantic Flying Club often charges higher fees than many competing airlines, they do still offer a handful of good redemptions that you shouldn’t count out…especially since Virgin Atlantic Flying Club miles are so easy to get a hold of! We hope our list of the best ways to use Virgin Atlantic miles was helpful, now go earn some points and start saving up. Happy redeeming! What are Flying Club miles? Flying Club is the frequent flyer mile program of Virgin Atlantic. What are Virgin Atlantic Flying Club miles worth? The value of Virgin Atlantic Flying Club miles depends on what kind of ticket you are redeeming with your points. Most people would value their Flying Club miles around 1.2 cents each. However, it is possible to find redemptions that are much better. For example, a business class flight on Virgin Australia could have values over 5 cents per mile! Who are Virgin Atlantic's partners? Are Virgin Atlantic Flying Club tickets refundable? Virgin Atlantic charges very reasonable fees to change or cancel an award ticket. Change fees are only $30, and a cancellation with mileage redeposit costs $50. When do Flying Club miles expire? Flying Club miles expire after 3 years if there has not been account activity. OTA vs. Metasearch: A Quick Vocabulary Lesson! It is easy to accrue the miles – not so easy to spend them. For the second year in a row I am having difficulty finding ANY round trip Premium seats to the Caribbean (this year, hopefully, Tobago) between November 2019 and February 2020. I totally agree with you. We go to St Lucia twice a year and are not having any luck with getting a companion ticket or any other reward or upgrade. It is so frustrating.